This post is in no small part an excuse to post a photo of my parents on here. It is also a review (of sorts). Apparently people normally only drink Chablis at Christmas. I’m not enough of a wine buff to have known that but when approached to try Chablis in a summer setting, I thought it sounded like a rather good plan. So I took one bottle to dinner at Mum and Dad’s and left the other bottle with them so that they could take it to their friends in Gloucester. I’ve spent may happy summers in France and sitting out on the patio on a warm summer’s evening with a glass of this wine, eating good food and setting the world to rights with Mr B, Mum and Dad was perfect. Also, it made me REALLY want to go and visit the town of Chablis and the burgundy area. As I say, I don’t know that much about wine but it tasted light, refreshing and just sweet enough for me. 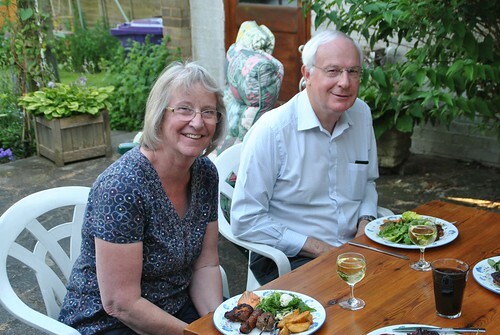 It seemed to me to be a great accompaniment to Dad’s BBQ selection, a fresh salad, wedges and some pine nut pasta salad from Sainbury’s. All eaten at a very leisurely pace on the parental patio. 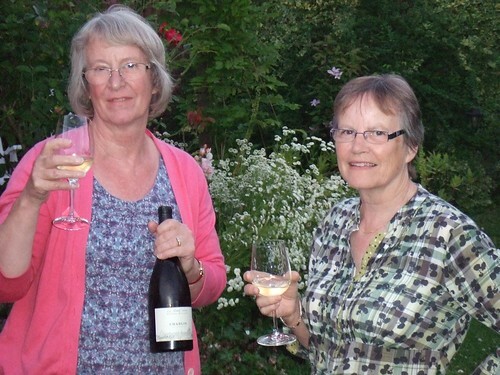 Here’s mum and her friend Irene standing in their garden with the second bottle (a petit Chablis). The weather wasn’t so good by then so they made an extra attempt to find a summery spot. Thanks! They also really enjoyed the bottle and agreed that it worked well as a summer drink. I’ve noted down the name of the bottle tried, as I try to keep an idea of the ones I like so that I can buy them in the future. 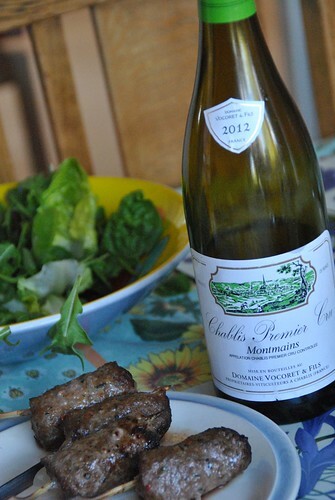 It was ‘Domaine Vocoret et Fils Montmains, Chablis Premier Cru 2012′ and costs about £14 normally. That’s more than I’d typically spend on wine (yes I know – heathen!) but I do start to understand why people pay a bit more. Also, given that I’d never just buy to drink on my own it makes it more reasonable as it’s an occasional thing. I was sent the two bottles by www.chablis-wines.com and Sopexa as I was unable to take part in their summer challenge. I wasn’t paid (except in wine) or required to say nice things. How nice to meet your parents via your blog. I do love a good bottle of Chablis – perfect for summertime sipping.